Travis Bayler (centre) ran the race of his life to win the Senior 400m after an outstanding surge from an outside lane to record a magnificent personal best and his first sub 50 second effort (49.92). 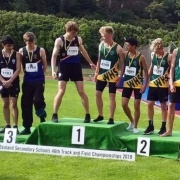 The New Zealand Secondary Schools Championships in Dunedin at the weekend proved to be a medal-fest for Whanganui athletes with the highest total medals won by Whanganui Schools in the 46-year history of the event. 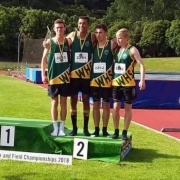 Whanganui High School, with six medals, was the highest from the school for many years and a clear reward for the efforts made throughout the year in developing their athletic programme (1 gold, 3 silver and 2 bronze). 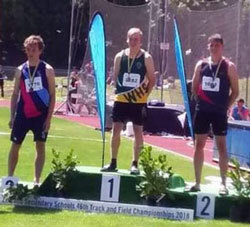 Wanganui Collegiate School returned with the school's best total of 19, three more than the previous best a year earlier — eight gold medals (also a best) and seven silver medals and four bronze medals. The 16 won on the track, the other three were on the road was also a best from the school. The success did not end with a high medal count. Five athletes won places in the New Zealand team announced at the end of the meeting. The selected athletes were Travis Bayler and Rebecca Baker (High School) and Emma Osborne, Genna Maples and Joseph Sinclair (Collegiate). Although the team is only a paper team the athletes selected (55) can apply for assistance to travel with teams and development tours. Last year the NZ Secondary Schools Athletic Association paid out in excess of $10,000 to leading athletes. Genna Maples (who took home three individual golds and two more from relays) was named Junior Girl Athlete of the Meet. Maples won her third unprecedented consecutive junior Girls 100 metre title and retained her Long Jump title. 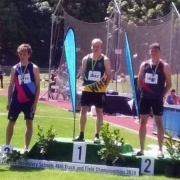 After two years of coming second in the 200m Maples finally won with an impressive 25.19 into a 4 metre per second head wind on a windy Dunedin weekend. Her time was the same as the winner of the senior event although the senior winner, Maia Anderson-Broughton, ran into a significantly lighter wind. Anderson-Broughton narrowly defeated Maples last year when they met in the Junior final and will renew battle when both are senior athletes next year. Maples teamed with Ana Brabyn, Lucy Brown and Sophie Williams to win the 4 x 100 to set a New Zealand Schools record (48.68) beating the record set last year by the Collegiate team. Maples joined Brabyn, Williams and Jessica Johnstone to retain the 4 x 400 title. Travis Bayler (High School) ran the race of his life to win the Senior 400m after an outstanding surge from an outside lane to record a magnificent personal best and his first sub 50 second effort (49.92). The winning margin was the narrowest of the championships (.01 second). In the preview I predicted a top 5 finish but the manner of his win hints that this is but the start. It was a Whanganui double over the one lap with last year's junior winner Emma Osborne (Collegiate) taking the senior title. Her time was a personal best 56.28 winning by almost a second over Charlotte Holland (St Cuthbert's) who had run under 56 seconds in the semi-final. Osborne joined Tayla Brunger, Sophie Redmayne and Grace Godfrey in the winning 4 x 400 team that stopped the clock at 3:57.87 for a new NZ Schools record. Ana Brabyn, who ran in two winning Collegiate junior relay combinations, was all class in the 800m. Brabyn cruised through the heat and semi and settled in midfield in the final before unleashing a burst 220m out to win convincingly with a new personal best 2:15.37. Brabyn has an exciting future as she combines aerobic endurance with genuine speed. 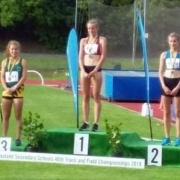 Rebecca Baker (High School), following her outstanding efforts in 1500m (silver) and 3000m (bronze), richly deserved to be added to the NZ Schools team as was Joseph Sinclair (Collegiate) following is surprise 800m silver. TRAVIS BAYLER - GOLD in Senior Boys 400m! REBECCA BAKER (left) - BRONZE in 3000m & SILVER in 1500m Senior Girls! SENIOR BOYS 4x400m relay team - SILVER & SENIOR BOYS 4x100m relay team - BRONZE! 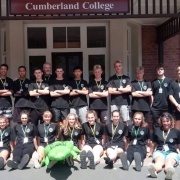 Our NZSS Athletics Team 2018 including coach Greg Fromont & Elaine Baker.